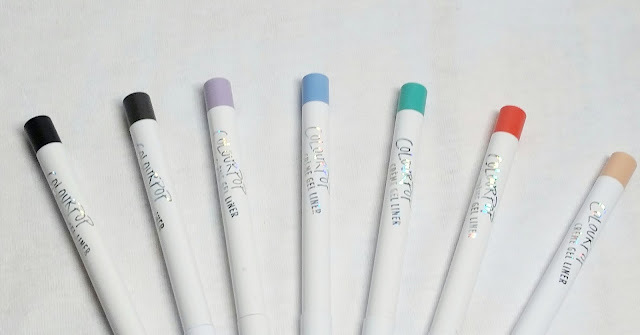 I'm going to be reviewing the Retractable Crème Gel Liners by Colourpop, a small (yet extremely popular) beauty brand. To learn more and to see swatches of seven of their retractable liners, then read this article. I'm going to be reviewing the Retractable Crème Gel Liners by Colourpop. If you follow my blog, then you know it's one of my favorite affordable brands and that I have done a couple posts on their products. 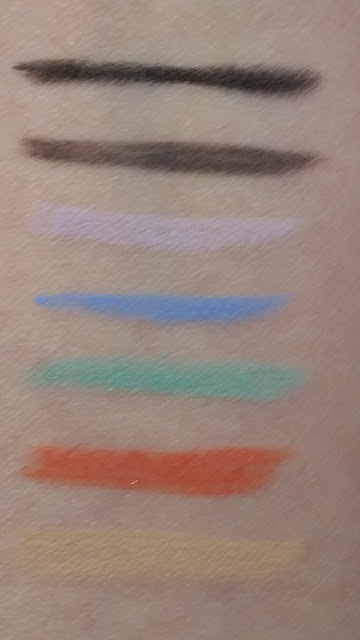 For today's post, I have seven of their retractable liners to swatch - six of them I bought myself and one came in my June Glam Bag from IPSY that I did an unbagging post on (which you can check out at the link). tched in order of mention. When I did the unbagging, I didn't want to get into too much detail because I was planning on doing a review. They're all pretty pigmented, especially the lighter shades. My concern with lighter colors is that they tend to get lost or disappear because they're so light that you can't see them, but these are pretty visible when worn. I mainly bought these to be used in the waterline to open my eyes up, but still have that pop of color. When I was trying the eyeliners out, they will wear away a little throughout the day, but for the most part, they stayed put so you don't really need to touch up too much with these. I personally can't say much about the staying power when it's worn on the actual eyelid. Having hooded eyes and oily skin, most eyeliners will transfer and become a smudgy mess on me within the first couple hours, if I don't prime and set my whole lid and liner with powder. My mom, who has drier skin and less hooded lids than I do, did try out one of the gel liners on her bare lid -without any primer- and it did last a good few hours. I know she had it on for at least four hours before she washed it off before going to bed, and it still looked as it did when she first put it on. I personally prefer the gel liners in the pot for the lid because I can get away with just laying down an eyeshadow primer and they won't budge once dry. I will say that these retractable liners are pretty delicate. When I got them, all seven were fine, but when I was swatching, the tips to two of the liners broke off. I will admit, I tend to be heavy-handed and was using more pressure to swatch than what you would use to apply to the eye. Also when I was pulling to open Puppy, the orange shade, the actual liner broke and fell out (well... flew out) - I was able to push it back in though. It might have been that I pulled or was gripping it too hard. When I was opening it, I was just straight up pulling on the cap and probably exerting more force than necessary. With these, you want to lightly pull then twist so that cap comes right off. I do like the pigmentation and color of these eyeliners, but be careful as they are fragile. If you want something sturdier or where you don't have to worry about breaking them, then I would get the Crème Gel Liners in the pots. They do cost a dollar more than the retractables, but the pots are pretty sturdy and I have seen them used in the water line as well.